Years ago, I became very fascinated with alchemy — the notion that something with low value could be transmuted into something with great value. I loved the stories about turning water into wine or lead into gold, and I studied them intently tearing apart every number and ingredient for symbolic value. I felt in my heart that it could be done, but how? Were the stories literal or metaphorical? I wasn’t interested in getting rich. I hoped that alchemy was about finding our own human value in the world. I wondered if there was a practical side to alchemy, something that we could all use to improve our lives. I’d come to realize that the truth about anything has practical value and works for everyone. It was said that alchemists were generous with their instructions. Some published literal recipes and others embedded alchemical secrets in stories. But it was widely agreed that alchemists left out one ingredient from every recipe or story — keeping the secret from the average Joe. I spent months in libraries looking for the missing ingredient. At first, I thought that perhaps different alchemists left out different ingredients, and I could piece together different stories and recipes like a puzzle. But that didn’t work. Eventually, I realized that the missing ingredient wasn’t physical. Like an optical illusion, the True Self perspective was the missing ingredient. Nothing was missing if I read the story through true eyes. But if I read it literally through false eyes, it appeared to be incomplete. Damn, that was cool! Just like mythology and religious stories, alchemical stories took the same Humpty-Dumpty fall. People lost their True Self perspective (eyes to see and ears to hear), and you can’t understand ancient stories unless you read them from your True Self. From the false self perspective, they appear incongruent and disjointed. They seem to be missing something or to be badly translated. If you look at the word Gold, it’s God with an L. The L in Hebrew (Lamed) was the central letter of the alphabet and the tallest letter. The tallest could be conceived as the most powerful, the king, who in the ancient world was the center and often treated like a God. Gold relates to a physical God. In Greek the true King was the Christós or Christ (annointed or initiated one). But the True King wasn’t just one person or King. He was the high initiate, the True Self in all of us, an inner King. When this part of us Leads (is the center), then we live and behave from a completely different perspective than when our false self leads. In the ancient mystery schools, alchemy was about the transformation of the false self to the True Self. The final transformation was turning the body from the mortal form into the Temple of Solomon. (Sol – Om – On were three words for the sun — the triune nature of God). The initiate’s body was to become a temple for the sun, the True inner King. But remember, this wasn’t a stupid pagan belief. The sun was the metaphor for the perfect masculine (yang) energy because it gave light and warmth unconditionally without asking anything in return. The True King took all of his joy from giving and loving (not taking and spending). The sun, of course, is golden in color so ancient kings surrounded themselves with gold. We are all leaders or suns in some way. If we are leaders of a family, company, or classroom, we can practice being more like the sun. We can practice unconditional loving and giving. That’s practical alchemy. But I love to use practical alchemy to grow while creating material things. To do this, choose a project, preferably one that involves an idea, as well as a hands-on component — something you really want to do and don’t yet think you can. Painting a picture, making a perfect pie, growing a garden, building something, creating a business, or training a pet can all be alchemical projects. What you must recognize is that you do know or have access to everything necessary to take this project to perfection. Only beliefs stand in the way of your success. First get a clear vision of the result you desire. Follow any inspired actions throughout the process — remember inspired actions have no emotional component. You aren’t willing the project into submission. If you are inspired to take a class or read a book that’s fine, but don’t give your power to the teacher or author. Just get the information that you need to move forward. You’re putting the pieces of a puzzle together, not submitting to another’s way of thinking. Notice any fear or self-doubt that arises, and let that go as you move along. Continue to take any action you feel certain of. If you keep letting go, the inspiration for the next step will keep you moving forward. If your results aren’t perfect, you look for what beliefs you have that produced the less-than-perfect result. Continue following inspiration and letting go. Then take action again. Keep repeating this until you get to the perfection you envisioned. We all do projects all the time; we just don’t do them from the alchemist’s mindset. The alchemist was comfortable with not knowing everything; he didn’t need a step-by-step recipe or outline. As you let go of your beliefs and follow inspiration, you find that you know more than you thought. You grow in True confidence. 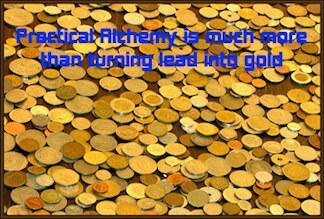 When the ancient alchemist used the process of creating and the results of his efforts as feedback, he purified his own mind — his mind of lead turned into a mind of gold, his True Self. He became the center, the True King of his world. He became One that would Lead with unconditional love and the pure spirit of giving. He became a master of life. No Labels, No Lies is about the art of freeing our mind completely from beliefs, judgments, and false thoughts based on the concepts once taught in ancient mystery schools. It's not like anything else out there. If you are new to this site, you might want to start with some of the older posts. The concepts and techniques that I present build over time. So you will find the oldest posts to be simpler and easier to apply in the beginning. There is also additional, more detailed information on many topics at my other website: http://gatewaytogold.com. Gifts are never expected; however, they are very much appreciated. And besides, I LOVE surprises. How Do You Know If Someone is Their True Self or False Self? Storytelling or History: What's the Difference?